Bookstore sales in January fell 10.6%, to $1.1 billion, according to preliminary estimates from the Census Bureau. The drop mirrors the beginning of last year, when January bookstore sales fell 8.5%, the worst monthly result for 2018. After that, bookstore sales rebounded most of the rest of the year and finished up 1.7%. By comparison, independent bookstores have done better than the Census Bureau average. As of March 6, sales at ABA member stores, as reported to the weekly bestseller lists, are up nearly 2% over 2018. Total retail sales in January rose 3.3%, to $459.8 billion. 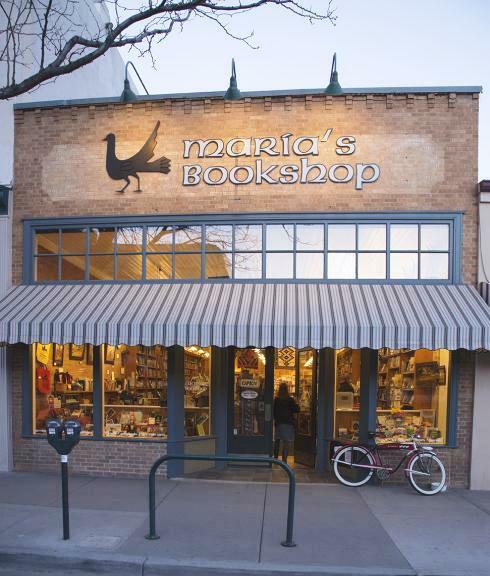 Ownership Change for Maria's Bookshop in Durango, Colo.
"The 'For Sale' sign has come down!" Maria's Bookshop in Durango, Colo., announced yesterday. The bookstore, which was put on the market last spring, unveiled an ownership transition plan that will keep the bookstore in the family. Evan Schertz, son of Maria's Bookshop owners Andrea Avantaggio and Peter Schertz, will join the family ownership of the business. A Durango native who will soon graduate from Colorado School of Mines, he "grew up with this bookstore. I'm very excited to step in to learn all I can and lead Maria's Bookshop into the next chapter." Maria's was founded in 1984 by Dusty Teal. Avantaggio and Schertz have owned and operated it for the past 21 years. "Finding the next owner within our family is extraordinary" said Peter Schertz. "While we have, of course, dreamed about family ownership of the business, we weren't sure the timing would work out or the interest would be there." An announcement of the decision on the bookshop's website noted that "Evan is the one who recognized this as an opportunity he couldn't pass up. It has become increasingly clear to Evan that his heart lives in the community of Durango. Maria's Bookshop ownership offers the strong community and business connections he has come to appreciate as well as the opportunity to apply the analytical and innovative mindset which drew him to study engineering." "I grew up in Durango and I value the quality of life and the community," he said. "I intend to get involved and contribute to making this place even better. I'll rely on the guidance and support from our staff and our customers to help me find successful ways to continue to grow this business." His parents plan to continue working at the store for the foreseeable future. Inspired to show Evan the inner workings of the business and introduce him to more of the community as well as industry professionals, Avantaggio said, "Evan is passionate, smart and eager to learn. The future is bright for Maria's Bookshop and Durango." On Facebook, the booksellers posted: "We can’t thank you all enough for your patience and support while we explored potential futures for Maria’s Bookshop. As we said all along, Maria's Bookshop isn’t going anywhere and we hope you're as eager as we are for what lies ahead." "I was drawn to engineering by the problem-solving and the critical thinking involved in looking at systems and seeing how they work. That makes owning a bookstore not such a crazy idea,” Evan Schertz told the Durango Herald. "He's been around the shop his entire life. He knows what the shop means. Maria's is part of the family. It's part of the dinnertime conversations. We just don't set a plate for it," Avantaggio said. 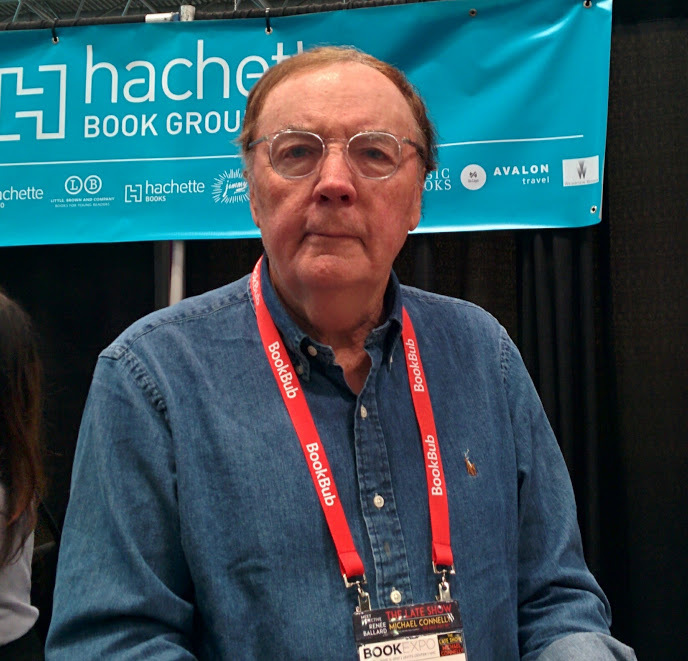 James Patterson has pledged $1.25 million to save classroom libraries in the fifth installment of his Patterson Partnership with Scholastic Book Clubs. The bestselling author plans to give 4,000 teachers across the country individual grants of $250, matched by 250 Bonus Points from Scholastic Book Clubs, to further assist them in acquiring books and other materials for their classrooms. Applications are being accepted through July 31 and winners will be announced in September. To date, Patterson has donated $7.25 million through his partnership with Scholastic Book Clubs; this year's pledge brings the total to $8.5 million. In 2018, the project drew a record 127,000 applicants. In a new initiative this year, $250,000 will be allocated to 500 "new" teachers--with three years of experience or less--each of whom receives $500 and 500 bonus points to help fill their bookshelves. To apply, teachers need to explain in fewer than 100 words how they plan to use $250 and 250 Bonus Points to help build their classroom libraries. All teachers in pre-K through grade 12 in U.S. schools are eligible to apply for a grant. Patterson hopes teachers and students will share their experiences in their communities using #PattersonPledge. "Illiteracy--or lack of reading proficiency--is a huge and often daunting issue in this country," said Patterson. "In many, many states, more than 40% of students read below grade level. This is a shocking statistic. Tackling this epidemic can be overwhelming for parents and educators alike. But we have to start somewhere. And I think getting books into the hands of children is an excellent place to start. My hope is that my partnership with Scholastic helps teachers fill their classroom bookshelves, and gives their students access to books that they're excited to read--and ultimately, to foster a lifelong love of reading, as I strongly believe that better readers make better people." Judy Newman, president of Scholastic Book Clubs, noted that Patterson's "vision of making great books available to all students is perfectly aligned with the work we do every day. The 800,000 classroom teachers who use Scholastic Book Clubs, on behalf of the millions of children they teach, need resources to build classroom libraries filled with books that are well suited to their students' interests, reading abilities, and imaginations--and provide easy and barrier-free access to those titles. I continue to be awed and inspired by James' generosity and his determination to put ample resources behind the vision of great books--and literacy--for all." The promotion will run three times per year, in April, June and October, and for each promotion the participating presses will create at least two playlists, or themed collections of titles, offered to indies at a higher than usual discount. At the same time, the presses will be running a display contest based on the promotion, and the winner will receive $500, with half going to the store and half to the bookseller in charge of the display. The debut playlists are "Quick Reads" and "Award Winners," and feature titles from Catapult, Europa and Seven Stories. Grove will come on board with the June promotion. 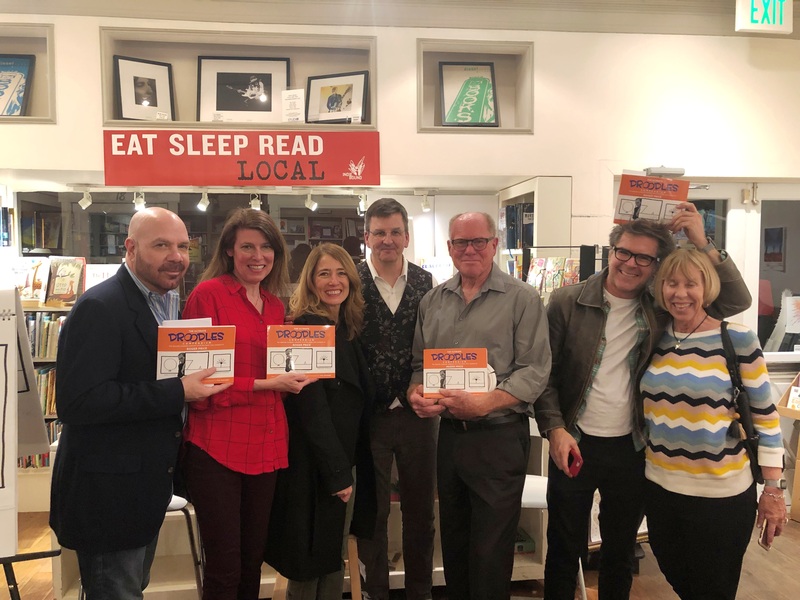 "What we're really trying to do here, as independent publishers, is help bookstores make the experience of discovery as vivid and full of surprises as possible for their customers," said Dan Simon, publisher of Seven Stories Press. "There's a push from the big five of more and more commercial product. The independent publishers, very like the independent booksellers, stand for something a bit different." The Indie Playlist program has grown out of a monthly promotion that Seven Stories launched in August of last year. It was inspired by discussions with the executive director and president of the New Atlantic Independent Booksellers Association about how independent publishers can run promotions that also support indie booksellers. The previous promotion also featured themed collections of titles and a display contest, though that version had a smaller prize. The Book Industry Charitable Foundation has kicked off its annual spring fundraising drive. The Share the Good campaign will again promote becoming a monthly sustaining donor, with the goal of encouraging 50 booklovers from across the country to join the 222 booksellers, booklovers and bookstores who are current monthly sustaining donors. "No amount is too small," said Binc executive director Pam French. "Donations from $5 to $100 a month add up when we give together as a community to help booksellers in need. We depend on our sustaining donors to keep the bookseller's safety net strong. As a community, current sustaining donors help two booksellers through medical emergencies and natural disasters every month of the year. The aim of our Share the Good campaign is to be able to help more booksellers in need every month. We've already seen that the need for assistance is growing this year, which means the support for the booksellers' safety net needs to grow too." Regional independent bookseller associations are also involved in the Share the Good campaign. Binc is offering a celebratory ice cream social to the region that has the most new sustaining donors sign up in April. Those who are already sustaining donors can increase their monthly donation to help their region win the contest. Last year, both the New England Independent Booksellers Association and Southern Independent Booksellers Alliance earned an ice cream party at their fall trade show. For 2019, the New Atlantic Independent Booksellers Association has already begun promoting the campaign to member stores, writing in a recent newsletter: "While [an ice cream social] is fun, it is more rewarding to know that any amount of money you donate each month adds up to life-saving help for a bookseller." Award-winning science fiction author Vonda N. McIntyre died April 1, File 770 reported. She was 70. McIntyre wrote novels, short stories and media tie-in books, edited a groundbreaking anthology of feminist SF, and founded the Clarion West Writing Workshop. She won the Hugo, Nebula and Locus awards for her 1979 novel Dreamsnake, and another Nebula for her 1996 novel The Moon and the Sun. In her obituary, Tom Whitmore wrote: "In media fiction, she will probably be most remembered as the author who gave Ensign Sulu a first name (Hikaru) in her Star Trek novel The Entropy Effect: that name was later written into one of the Star Trek films. With Susan Janice Anderson, McIntyre edited one of the first feminist science fiction anthologies (Aurora: Beyond Equality, 1976)." She also founded Book View Café, an online publishing collective for member authors to sell their e-books. Nisi Shawl, a Clarion West board member, said, "Vonda was one of Clarion West's founders, and has always been our fairy godmother, bringing comfort and whimsy to class after class with her impromptu visits and gifts of crocheted sea creatures. She was the Good Witch of the Northwest, a fearless public reader and a stellar private writer who is missed by all." Whitmore observed that McIntyre "did ten times as much behind the scenes in the science fiction community than she did out in the open. Her award-winning stories, her media tie-ins, and her editing were all quite visible, and important: more important in the long run will be her legacy of support for individuals and institutions.... She was a quiet, tireless force helping bring women's voices forth in the SF community," which "lost a major pillar today." In a tribute on Krypton Radio, Susan Macdonald described McIntyre as "one of the strongest and most unique voices in science fiction.... It is hard to fully express how much Ms. McIntyre meant to the science fiction community. Her generous and nurturing nature has helped launch many a writing career, and she was a favorite at science fiction literary conventions wherever she went. While we are saddened by the knowledge that there will be no more pleasant conversations and chance encounters with Vonda McIntyre, no more guiding words, and no more of her smiles, so long as we remember her, she will never truly leave us." DIESEL, A Bookstore in Los Angeles, Calif., hosted a launch celebration for The Ultimate Droodles Compendium: The Absurdly Complete Collection of All the Classic Zany Creations of Roger Price (Tallfellow Press). The event, held on what would have been Roger Price's 101st birthday, featured a "Caption the Droodle" contest and Droodle-themed snacks and swag. Pictured: (l.-r.) actor/comedian Jason Stuart (emcee); Tallfellow publisher Claudia Sloan; Carla Sinclair, co-founder of Boing Boing; author Fritz Holznagel; Roger Price III; Mark Frauenfelder, co-founder of Boing Boing; Judy Price. 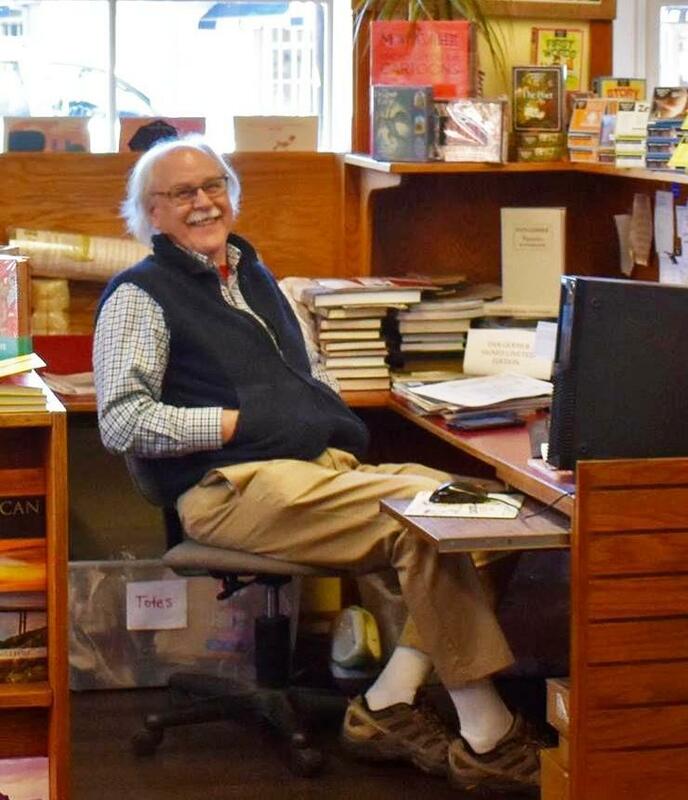 Tom Gerard, whose 40-year career in bookselling includes the past 15 years at the Book Loft, Solvang, Calif., is retiring. The Santa Ynez Valley Star reported that Gerard "has become a fixture at the Book Loft and in the community, due not only to his extensive knowledge about books, writers, publishing and bookstores but also because of his friendly southern charm and storytelling skills." 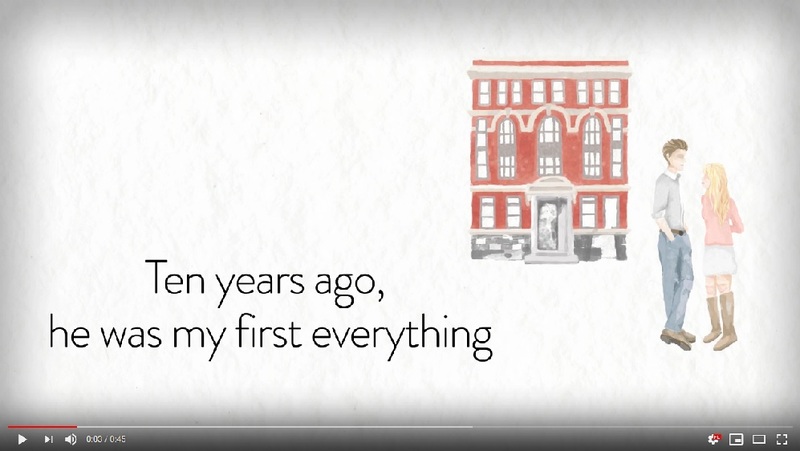 "I've been in the bookselling world my whole adult life," he said. While attending Millsaps College in Jackson, Miss., he worked at the college bookstore. After earning his degree and teaching for four years, he decided in 1974 to pursue a different direction. "I became enamored with the idea of opening a bookstore with a couple of partners in Natchez, Miss., which we called Page One," he said. "Unfortunately, that store closed after only two years." He moved to Jackson in 1978 to work with a friend at Lemuria Books, "which continues to be one of Mississippi's finest independent bookstores. I worked there for 15 years. It was great because my friend and I could talk book business together." At 43, he relocated to Eugene and worked at the University of Oregon's bookstore for about eight years, then learned about an opening at the Book Loft. "I met with Ed Gregory, the manager, and Kathy Mullins, the owner, and they hired me, so I moved to Lompoc." Gerard said he has been "fortunate to work in some really great bookstores during the past 40 years and it has been a delight working at the Book Loft. It's a unique book environment, in that it has new books and is also a used bookstore plus a museum dedicated to one of the icons of literature. It's been an education for me to be exposed to people from all over the world who know and love Hans Christian Andersen. I also feel like I'm leaving the store in good hands, under the leadership of Echo Molina, the manager, and my fellow booksellers." "It's the best kind of spring cleaning!" according to Hyde Brothers, Booksellers in Fort Wayne, Ind., which shared a photo of its sidewalk chalkboard. 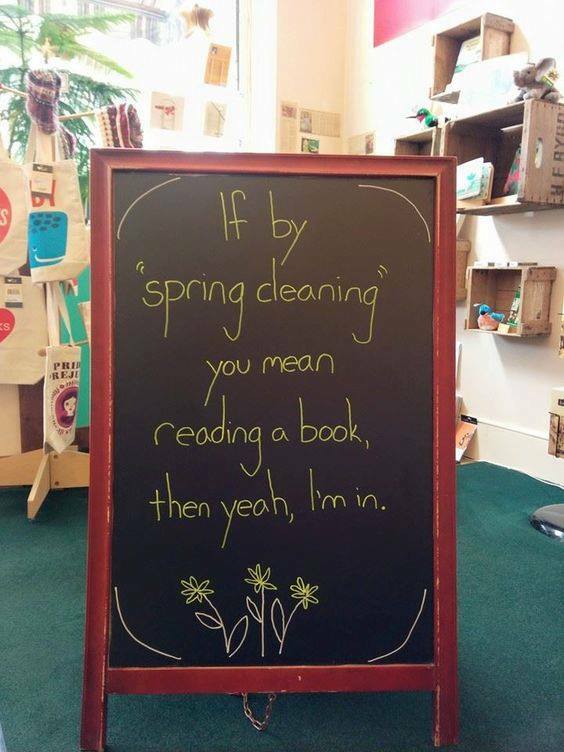 The message: "If by 'spring cleaning' you mean reading a book, then yeah, I'm in." Alexandra Primiani has been promoted from senior publicist to associate director of publicity at Melville House Publishing. Emily Weldon has been promoted to associate publicist. Most recently, she was publicity and marketing assistant, and before that she was publicity and marketing intern. Pamela Crossan joins the company as publicity and marketing assistant. She was formerly a PR assistant at Element Brand Group and before that was a publicity intern with Wunderkind PR. The Girl He Used to Know: A Novel by Tracey Garvis Graves (St. Martin's Press). Morning Joe: Stacey Abrams, author of Lead from the Outside: How to Build Your Future and Make Real Change (Picador, $17, 9781250214805). A trailer has been released for Scary Stories to Tell in the Dark, the Guillermo del Toro-produced film based on Alvin Schwartz's bestselling books. Del Toro (Shape of Water) adapted the screenplay with Dan Hageman and Kevin Hageman. The film will be released August 9. Directed by André Øvredal (The Autopsy of Jane Doe), the project weaves the stories "into a rich and terrifying tapestry that pays tribute to the source material while introducing its legacy to a completely new audience," ScyFy Wire reported. Del Toro explained his longtime obsession with the books: "I basically was roaming through a bookstore in San Antonio, Tex., in my early teens and I came upon this volume that had an irresistible title, Scary Stories to Tell in the Dark. The cover illustration was so creepy and I started browsing it. And the telling of the tales was incredibly efficient, lean and mean. It really was like having a campfire between those two covers. "The beauty about the book is that each story is self-contained, but that's the nightmare of adapting it and making it into a film. So I had to come up with a concept that encompassed a theme. And what we did is we tried to find a period of time in which stories affected everyone--who we were as humans, and even as a nation at that moment. And we started to very carefully lay down the pieces to make it thematically relevant to the stories we were telling." He added: "The idea is that the books are favorites amongst young readers. And I think that there are two or three generations of parents that know the books. So it's not an unknown. They know that this is a roller coaster. It has a sense of fun and has really a throwback, wholesome feeling, but it's also scary. So it's really a ride, but there is a safety bar in it." 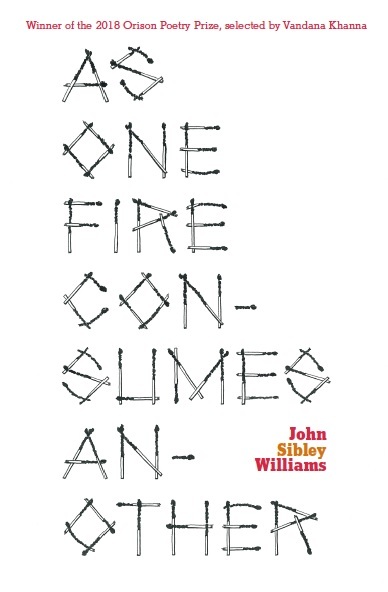 John Sibley Williams is the author of As One Fire Consumes Another: Poems, just out from Orison Books, selected by Vandana Khanna for the Orison Poetry Prize. Another collection, Skin Memory, was chosen by Kwame Dawes for the Backwaters Prize and will be published by the Backwaters Press later this year. Williams is also the author of Disinheritance and Controlled Hallucinations. 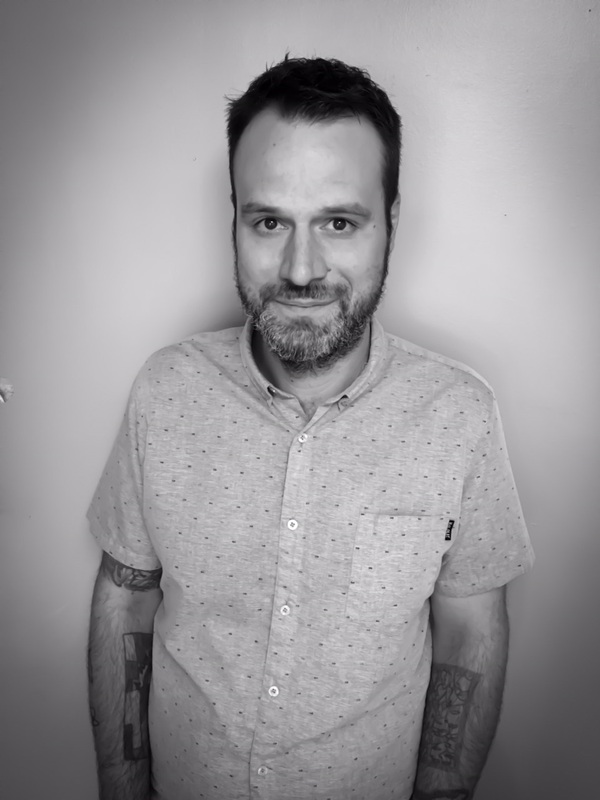 A 19-time Pushcart nominee, Williams has won the Philip Booth Award, the American Literary Review poetry contest and the Phyllis Smart-Young Prize, among others. He serves as editor of the Inflectionist Review, works as a literary agent and lives in Portland, Ore., with his partner and twin toddlers. As I tend to read multiple poetry collections simultaneously, bouncing back and forth between them to keep things fresh and surprising, my nightstand is always a bit crowded. I'm about to finish Admission Requirements by Phoebe Wang, an intimate collection of memoirish poems that speak to Wang's distinctive experience as a Canadian citizen with Chinese heritage. I'm also reading Cutting the Wire: Photographs and Poetry from the US-Mexico Border, a powerful cultural collaboration between photographer Bruce Berman and poets Ray Gonzalez and Lawrence Welsh. And awaiting my attention is Monica Berlin's second collection, Nostalgia for a World Where We Can Live. I love her long, fluid lines and landscape-inspired voice. Although I don't have any direct memories from toddlerhood, I'm told no one could yank Shel Silverstein's The Giving Tree from my hungry little hands. Now that I'm a parent, I can understand why. I choke up each time I read it to my little ones. In middle school I read armloads of horror novels, then moved to Franz Kafka, Albert Camus and Milan Kundera in high school. Looking back, I think the mystical strangeness of these authors mirrored my adolescent uncertainty and restlessness. Many of their characters are lost, be it within a heartless bureaucratic system or their own conflicted hearts. How better to describe one's teen years? Paul Celan was able to make language pop and sizzle like bacon deep frying in a skillet, all while remaining imagistic and surreal. I never knew where I stood with him, nor him with me, and that adds to his strange linguistic power. Octavio Paz remarkably spoke both to fundamental human truths and a specific cultural zeitgeist through structural experimentation and heartbreaking prosody. Carl Phillips may be my favorite contemporary poet. Each new book peels back another layer of soul, and he consistently inspires me. I'll have to add Franz Kafka here, too, if for no other reason than I've read his oeuvre three or four times. And I'll never stop rereading Julio Cortázar's mind-altering novels and short stories. This may sound sacrilegious in the poetry community, but I've never quite read Leaves of Grass in its entirety. I know, I know. And although I've relished Dostoyevsky's immense novels, I haven't touched any of Tolstoy's. I know, I know. Although new to our poetry world, Marcelo Hernandez Castillo's debut, Cenzontle (BOA Editions, 2018), is one of the most remarkable collections of intimate, broken, beautiful poetry I've ever read. Comparable to another of my contemporary favorites, Ocean Vuong, Castillo carries the world on his young shoulders and somehow, perhaps magically, the world remains there, lifted and less heavy. A few years back, having digested the novels of Halldór Laxness and Sjón, I was on the hunt for more Icelandic fiction. The cover of Kristin Omarsdottir's Children in Reindeer Woods seduced me into purchasing it without reading its synopsis. Its sharp angles, inimitable font and artificially bright colors captured my attention, and the marionette strings from which the title hangs implied restraint of willpower and manipulation from greater forces. That's a tough one. My parents were rather open-minded about my reading choices, even at a young age. However, I remember hiding James Baldwin's Giovanni's Room deep in my high school locker after a few peers bullied me for reading it. One Flew over the Cuckoo's Nest by Ken Kesey awoke something deep within me when I first read it. I must have been around 15 or so. In less than 300 pages--a few days of reading for a hungry teenager--the various prisons we build around ourselves to keep the world out and those the world squeeze us into for safe keeping fused. Cages are cages, and I realized many of my own were self-made. An impossible task to name a single line, but Pablo Neruda's "My soul is an empty carousel at sunset" speaks to the beautiful, dark contradiction of the human condition in a way few lines of poetry or prose can match. Although there are hundreds of books I can't imagine my creative life without, the five that immediately spring to mind are One Hundred Years of Solitude by Gabriel García Márquez, All the Names by Jose Saramago, Night Sky with Exit Wounds by Ocean Vuong, City of Rivers by Zubair Ahmed and Carl Phillips's fantastic book on writing The Art of Daring: Risk, Restlessness, Imagination. Each of these works reach deep into my heart. Each of them hurt me a little. Each push me to climb and climb from myself, hopefully toward greater literary heights. I don't know how many times I've read Man's Search for Meaning by psychologist and Holocaust survivor Viktor E. Frankl. A dozen? With each reading, I find new questions to ask myself, the world and my place in the world. This seminal work frames much of my understanding of human nature, and I don't think a day goes by in which its insights aren't validated in my daily life. But there was nothing like that first time reading it. It was as if the earth shifted. It was as if I'd stepped from a dark tunnel into an early morning summer sun. I think my eyes are still adjusting to its light. Before reading Kevin Young's staggering collection The Book of Hours, I had kept my family life removed from my poetry. For some reason, I felt the two should remain distinct entities. Family was hands-off material. Perhaps I was terrified of inviting readers into my home. That kind of intimacy makes a writer feel naked. But Young's book, so abundant in rich poems about his wife and child and pregnancy and fatherly fears, proved to me that one can write from the heart without losing the universality of language poems require to reach off the page and haunt a reader. "When Aidan was born, everyone thought he was a girl." But his name, his room, his clothes just didn't fit. Aidan realized "he was really another kind of boy. It was hard to tell his parents what he knew about himself, it was even harder not to": Aidan is transgender. With the help of other families with transgender children, Aidan's family figured things out. Now his parents have announced they are having another child, making Aidan a soon-to-be big brother. While Aidan wants "to make sure this baby [will] feel understood right away," strangers seem overly concerned about gender, asking his mother, "Are you having a boy or a girl?" His clever mother is ready with the perfect reply: "I'm having a baby." When others ask Aidan about having a new brother or sister, Aidan answers, "I'm excited to be a big brother." And he is! He helps his mother choose between seahorse and penguin outfits, assists his father in painting the baby's room sky blue and puffy-cloud white, and he practices his read-aloud skills. As the baby's arrival approaches, he also whispers his fears: "I don't want them to feel like I did when I was little, but what if I get everything wrong? What if I don't know how to be a good big brother?" Thoughtfully, his mother explains, "We didn't know you were going to be our son. We made some mistakes, but you helped us fix them." Most fundamentally, "you taught us how important it is to love someone for exactly who they are." Like Aidan, when author Kyle Lukoff (A Storytelling of Ravens) was born, everyone thought he was a girl; he reveals in his author's note that parts of his own story are "very much like Aidan's." 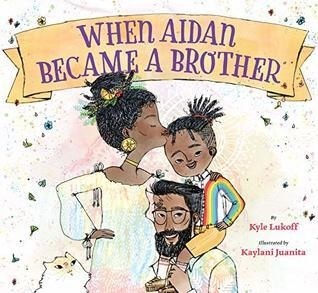 Lukoff hopes to encourage communication with When Aidan Became a Brother: "If you're a kid who is transgender like Aidan (or transgender but not like Aidan), I'm hoping this story helps you understand what you're feeling, and helps you talk about it if you're ready." Kaylani Juanita clearly enjoys challenging gender expectations with her digital illustrations. As Aidan explores "different ways of being a boy," Juanita shows him posing in a superhero cape (with cutouts from his discarded dresses), wearing pink shoes with bows. His wardrobe couldn't be more gender-defyingly fabulous, comprised of a mishmash of stripes, zig-zags, checks and animal prints. On Aidan's desk, the 50,000 Names for Boys and Girls book gets gender-neutralized to 50,000 Names for Boys babies and Girls babies as he explores names like "moss" and "river." Shelf Talker: When Aidan, a transgender boy, learns he's going to be a big brother, he helps his parents prepare for the newest addition to their family in the most welcoming ways.